Welcome back to Messier Monday! In our ongoing tribute to the great Tammy Plotner, we take a look at the Sagittarius Cluster (aka. Messier 22). Enjoy! Back in the 18th century, famed French astronomer Charles Messier noted the presence of several “nebulous objects” in the night sky. Having originally mistaken them for comets, he began compiling a list of these objects so that others wouldn’t make the same mistake. Consisting of 100 objects, this “Messier Catalog” would come to be viewed by posterity as a major milestone in the study of Deep Space Objects. One of these objects is the Sagittarius Cluster, otherwise known as Messier 22 (and NGC 6656). This elliptical globular cluster, is located in the constellation Sagittarius, near the Galactic bulge region. It is one of the brightest globulars visible in the night sky, and was therefore one of the first of its kind to be discovered and later studied. Located around 10,400 light years from our Solar System, in the direction of Sagittarius, M22 occupied a volume of space that is 200 light years in diameter and is receding away from us at 149 kilometers per second. M22 has a lot in common with many other clusters of its type, which includes being a gravitationally bound sphere of stars, and that most of its stars are all about the same age – about 12 billion years old. It is part of our galactic halo, and may once have been part of a galaxy that our Milky Way cannibalized. But it’s there that the similarities end. For example, it consists of at least 70,000 individual stars, only 32 of which are variable stars. It also spans an incredible 32 arc minutes in the sky and ranks as the fourth brightness of all the known globular clusters in our galaxy. And four must be its lucky number, because it is also one of only four globular clusters known to contain a planetary nebula. Recent Hubble Space Telescope investigations of Messier 22 have led to the discovery of an astonishing discovery. For starters, in 1999, astronomers discovered six planet-sized objects floating around inside the cluster that were about 80 times the mass of Earth! Using a technique known as microlensing, which measures the way gravity bends the light of the background stars, the Hubble Space Telescope was able to determine the existence of the gas giant. Even though the Hubble can’t resolve them because the angle at which the light bends is about 100 times smaller than the telescope’s angular resolution, scientist know they are there because the gravity “powers up” the starlight, making it brighter each time a body passes in front of it. Because a microlensing event is very rare and totally unpredictable, the Hubble team needed to monitor 83,000 stars every three days for nearly four months. Luckily, a sharp peak in brightness was all the proof they needed that they were on the right track. During their study time, the Hubble team caught six microlensing events that lasted less than 20 hours and one which endured for 18 days. By calculating the times of the eclipses and the spikes in brightness, astronomers could then estimate the mass of the object passing in front of the star. These wandering rogues might be planets torn away from their parent stars by the huge amounts of gravitational influence from so many closely packed suns – or (in the case of the long event) simply a smaller mass star passing in front of another. Two black holes were also discovered in M22 and confirmed by the Chandra X-ray telescope in 2012. The objects have between 10 and 20 solar masses, and their discovery suggests that there may be 5 to 100 black holes within the cluster (and maybe some multiple black holes as well). The presence of black holes and their interaction with the stars of M22 could explain the cluster’s unusually large central region. Other objects of interesting include two black holes – M22-VLA1 and M22-VLA2 – both of which are part of binary star systems. Each has a companion star and is pulling matter from it. This gas and dust, in turn, forms an accretion disk around each black hole, creating emissions that scientists used to confirm their existence. Messier 22 is one of only four known globular clusters that contain a planetary nebula. This nebula – catalogued as GJJC1 or IRAS 18333-2357 – is rather small and young, being only 3 arcseconds in diameter and 6,000 years old. It was discovered in 1986 using the infrared satellite IRAS, and identified as a planetary nebula in 1989. Chances are, magnificent Messier 22 was probably the first globular cluster to ever be recorded in the history of astronomy, most likely by Abraham Ihle in 1665. Over the years it has been included in many historic observations, including Edmund Halley’s list of 6 objects published 1715, and observed by De Chéseaux (his Number 17) and Le Gentil, as well as by Abbe Nicholas Louis de la Caille, who included it in his catalog of southern objects (as Lacaille I.12). “A fine globular cluster, outlying that astral stream, the Via Lactea [Milky Way], in the space between the Archer’s head and bow, not far from the point of the winter solstice, and midway between Mu and Sigma Sagittarii. It consists of very minute and thickly condensed particles of light, with a group of small stars preceding by 3m, somewhat in a crucial form. Halley ascribes the discovery of this in 1665, to Abraham Ihle, the German; but it has been thought this name should have been Abraham Hill, who was one of the first council of the Royal Society, and was wont to dabble with astronomy. Hevelius, however, appears to have noticed it previous to 1665, so that neither Ihle nor Hill can be supported. “In August, 1747, it was carefully drawn by Le Gentil, as seen with an 18-foot telescope, which drawing appears in the Mémoires de l’Académie for 1759. In this figure three stars accompany the cluster, and he remarks that two years afterwards he did not see the preceding and central one: I, however, saw it very plainly in 1835. In the description he says, “Elle m’a toujours parue tres-irrégulière dans sa figure, chevelue, et rependant des espèces de rayons de lumière tout autout de son diamètre.” This passage, I quote, “as in duty bound;” but from familiarity with the object itself, I cannot say that I clearly understand how or why his telescope exhibited these “espèces de rayons.” Messier, who registered it in 1764, says nothing about them, merely observing that it is a nebula without a star, of a round form; and Sir William Herschel, who first resolved it, merely describes it as a circular cluster, with an estimated profundity of the 344th order. Sir John Herschel recommends it as a capital test for trying the space-penetrating power of a telescope. 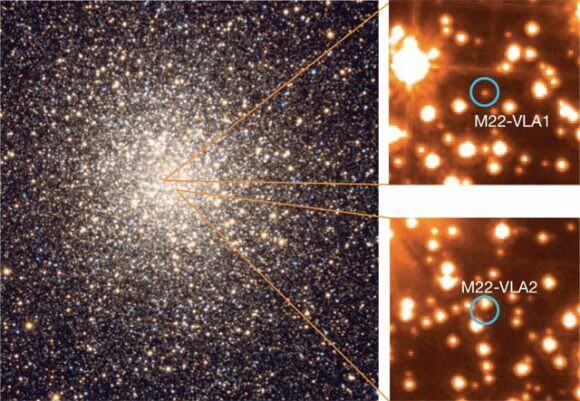 From its position almost on the ecliptic plane, bright globular cluster M22 is easy to find in optics of all sizes. The most important clue is simply identifying the Sagittarius “teapot” shape. Once you’ve located it, just choose the “lid” star, Lambda (Kaus Borealis) and look about a fingerwidth (2 degrees) due northeast. In binoculars, if you center on Lambda, M22 will appear in the 10:00 region of your field of view. In a finderscope, you will need to hop from Lambda northeast to 24 Sagittari and you’ll see it as a faint fuzzy nearby also to the northeast. From a dark sky location, Messier Object 22 can also sometimes be spotted with the unaided eye! No matter what size optics you use, this large, very luminous ball of stars is quite appealing. A joy to binocular users and an exercise in resolution to telescopes. Go on… Magnificent Messier 22 is waiting for you to appreciate it! Welcome back to Messier Monday! In our ongoing tribute to the great Tammy Plotner, we take a look at the Messier 18 open star cluster. Enjoy! One of these objects was Messier 18 (aka. NGC 6613), a relatively dim open star cluster located in the constellation Sagittarius. Located in close proximity to Messier 17 (the Omega Nebula), it is possible that these two clusters formed together. Located about 4,900 light years from Earth, and spread over an expanse measuring 17 light-years across, this group of around 20 stars is only about 32 million years old. Its hottest members are spectral type B3, yet you will also see many yellow and orange stars as well. But as already noted, M18 may not be alone in space. What a shame Smyth wasn’t around to later know that M18 could be paired with its nebulous neighbor! Because Messier 18 is nothing more than a small collection of stars which are slightly brighter than the background Milky Way stars, it isn’t easy to distinguish it using binoculars or a finderscope if you’ve never seen it before. One of the most sure ways of locating it is to become familiar with Messier 17 and simply aim a couple of degrees (about a field of view) south. While it won’t strike you as a grand object, you will notice that the stars are compressed in this area and that there are several dozen of them which appear brighter than the rest. In a telescope, use your lowest magnification. Since this is a very well spread cluster, it is easily resolved in even modest instruments. Welcome back to Messier Monday! In our ongoing tribute to the great Tammy Plotner, we take a look at the Messier 17 nebula – aka. The Omega Nebula (and a few other names). One of these is the star-forming nebula known as Messier 17 – or as it’s more famously known, the Omega Nebula (or Swan Nebula, Checkmark Nebula, and Horseshoe Nebula). Located in the Sagittarius constellation, this beautiful nebula is considered one of the brightest and most massive star-forming regions in our galaxy. From its position in space some 5,000 to 6,000 light years from Earth, the “Omega” nebula occupies a region as large as 40 light years across, with its brightest porition covering a 15 light year expanse. Like many nebulae, this giant cosmic cloud of interstellar matter is a starforming region in the Sagittarius or Sagittarius-Carina arm of our Milky Way galaxy. What you see is the hot hydrogen gas that is illuminated when its particles are excited by the hottest of the stars that have just formed within the nebula. Also, some of the light is being reflected by the nebula’s own dust. These remain hidden by dark obscuring material, and we know their presence only through the detection of their infrared radiation. Because M17 is both large and quite bright, its distinctive “2” shape isn’t hard to make out in optics of any size. For binoculars and image correct finderscopes, try starting with the constellation of Aquila and begin tracing the stars down the eagle’s back to Lambda. When you reach that point, continue to extend the line through to Alpha Scuti, then southwards towards Gamma Scuti. M16 is slightly more than 2 degrees (about a fingerwidth) southwest of this star. If you are in a dark sky location, you can also identify it easily in binoculars by starting at the M24 “Star Cloud”, north of Lambda Sagittari (the teapot lid star), and simply scanning north. This nebula is bright enough to even cut through moderately light polluted skies with ease, but don’t expect to see it when the Moon is nearby. You’ll enjoy the rich starfields combined with an interesting nebula in binoculars, while telescopes will easily begin resolving the interior stars.